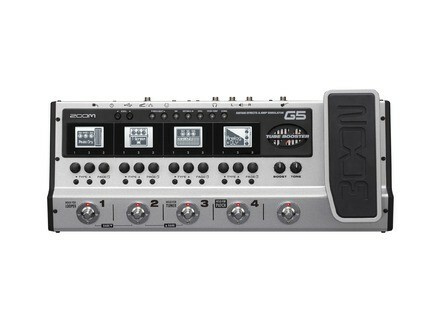 G5, Multi-Effects for Electric Guitar from Zoom in the G5 series. Zoom took the design of the G3 pedal and dialed it up a notch with the G5 Guitar Effects and Amp Simulator Pedal. The G5 combines a stompbox pedalboard and a multi-effects pedal and USB audio interface, along with an extra LCD display/footswitch interface, Tube Booster, 3D Z-pedal, and additional amp models and effects. The G5 offers four LCD displays, each with a corresponding footswitch and parameter knobs, which form a graphical interface and allow you to utilize up to nine stompbox and amp effects simultaneously. Or you can use the pedal’s 20 amplifier models, 100 stompbox effects and 120 built-in DSP effects to create your own sounds. The G5 also features a Tube Booster footswitch for adding up to 16dB of amp overdrive, as well as a 3D Z-pedal that lets you build sound control patterns or utilize the included 3D effects. The pedal can store up to 100 of your original creations. 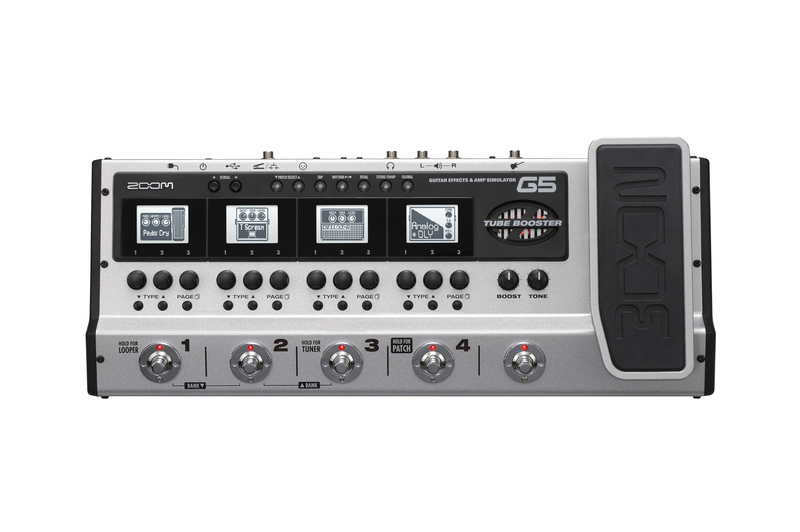 In addition to housing a 60-second looper, drum machine and auto-chromatic tuner, the G5 is a USB audio interface. Bundled with Steinberg’s Sequel LE DAW, you can also use Zoom’s Edit&Share software to create, edit, save and share your personalized settings on your computer. The G5 offers six hours of continuous operation on four AA batteries, according to Zoom. It also features USB bus and AC power options. Visit Zoom at NAMM 2012, located in Hall A, for more details. [NAMM] The Loar LO-215 & LO-216 The Loar introduces the LO-215 and 216, two small body single-0 guitars with a 25.4” dreadnought scale length. [NAMM] Two Notes Cab Two Notes Audio has announced the upcoming release of Torpedo CAB, a new stomp-box cabinet simulation to a guitar rig on a pedalboard.